On the 27th July 2012 the Mayor of the city Okoč (Slovakia) bestowed upon the honorary citizen title to the respected and esteemed native of the village, Lady Mária Czellárikova, Dame Commander of the Sovereign Order of Saint John of Jerusalem, Knights of Malta, Federation of the Autonomous Priories (KMFAP). The award ceremony took place during the solemn Mass, which was conducted by Mons. László Szakál – papal chaplain, the magisterial chaplain of KMFAP and by his fellow priests (Mgr. Alexander Sims – Roman Catholic parish priest, and Siard Dušan Sklenka parish – member of the Premonstratensian Order of Monks). 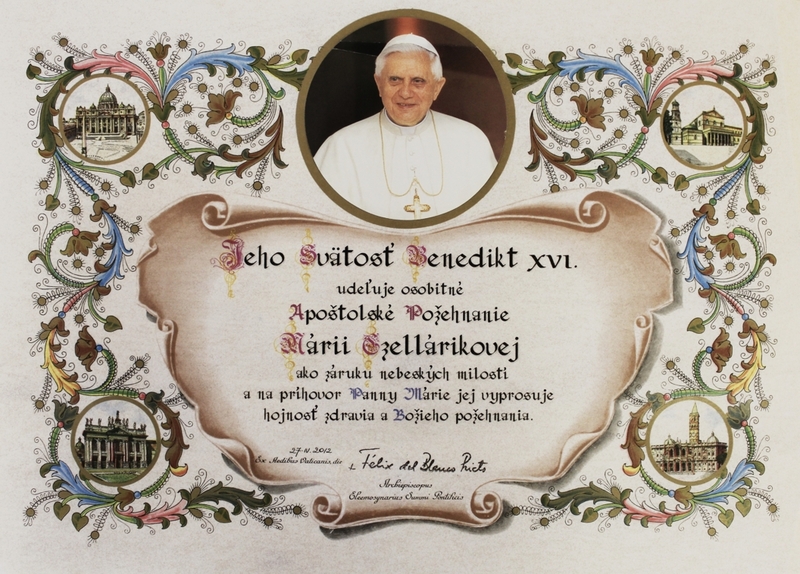 Then Father Siard Dušan handed over to Lady Mária Czellárikova the Apostolic blessing of His Holiness XVI. Pope Benedict, which was deserved by Lady Mária for her selfless humanitarian activities throughout the decades.